A brew as intense as a back-to-back session of the shot-per-minute pastime. Boasting almost a pound of hops, the super-bitter but smartly balanced flavor will help you power through to the 120th minute. Given this beer’s inspiration, I knew I needed something strong. Like, really strong. Something that could equate to drinking more than 10 beers in 2 hours. I hadn’t brewed an IPA before, and with summer right around the corner, now was the perfect time. But I didn’t want to brew just any IPA – I wanted something hop heads would love. 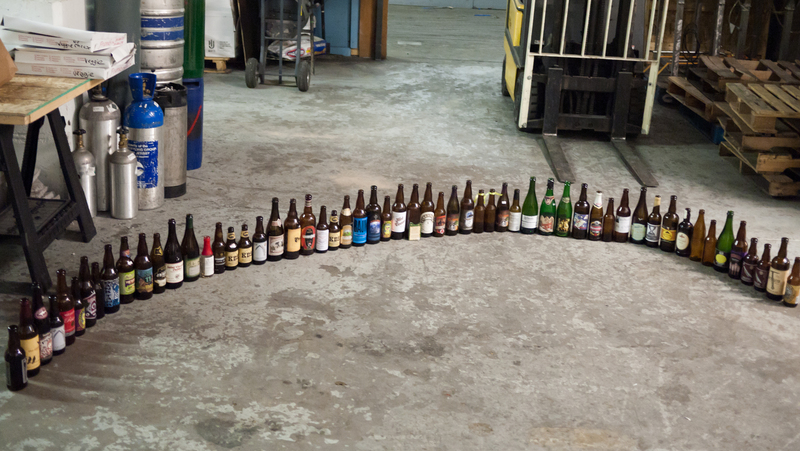 I did some research, and I started eyeing up More Beer’s Pliny the Elder clone. I mean, if you’re looking for a big beer, you might as well go with the former top-rated beer on Beer Advocate, right? Then I remember Pliny official categorized as a Double/Imperial IPA. 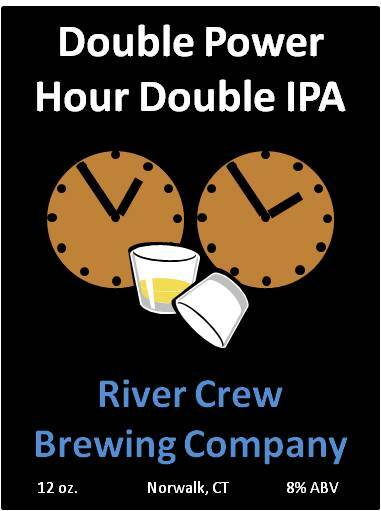 The story of our back-to-back power hour came to mind, and the Double Power Hour Double IPA was born. This recipe packs almost a pound of Centennial, Magnum, and Cascade hops on top of almost double digit poundage of malt extract, with some corn sugar for a little extra kick. It combines the first wort hopping technique with an extended boil and an aggressive dry hop. It’s a hop-lover’s dream, and has a big 8% ABV kick. It’s perfect for what I wanted, and really represents the Double Power Hour story. The beer itself turned out as you would expect from the recipe and procedure above – super bitter but has a nice malt body to back it up. The hops leap from the glass in a pleasant piney bouquet. The taste follows the nose – piney hops mix with a nice citrus note at first, with a hint of the malt backbone showing through. The hops reemerge on the back end, leaving a great hop floralness long after the beer has gone. This beer’s exactly what I wanted it to be, and fits with the name perfectly. I look forward to sharing it and enjoying it through the hot summer months. My fermentation fridge rocks! I had to call it into it’s first action of the season last week. I brewed Jake’s Swedish Blonde – a highly-hopped but light-bodied blonde ale for the summer. The beer was happily fermenting in my basement when Mother Nature decide to turn off the super-soaker and throw us into the oven, and weather went from mild and rainy to mid-summer hot overnight. Yeast isn’t the biggest fan of temperature swings, and I learned the hard way fermenting at too high a temperature throws off-flavors into the beer. So, as the thermostat in my house crept higher and higher, so did my worry about this beer. I checked the temperature in the basement and it was sitting around 72, and temperature inside the carboy was around 72-74, which is the highest I was comfortable with. I didn’t want to shock the yeast and put them to sleep, so I set the fridge to 55 degrees and monitored the temperature inside the carboy like a hawk. As soon it got to the 68-72 range, I set the temp as high as it could go, which I was presently surprised to find was 65 degrees. The fridge completely bailed me out and saved a batch of beer before it went bad. Jake’s Swedish Blonde is still fermenting away, enjoy temperatures of 63-68 degrees regardless of how hot it gets outside. It takes a ton of worry out since I can now control something most homebrewers can’t. I’m so glad I picked this thing up. The River Crew Brewing Company has a new tagline. Every beer is inspired by each other and our memories together. It’s our way of sharing our colorful experiences and personalities with you in the form of high-quality, hand-crafted beer. We think you’ll enjoy them, and ee hope they encourage you to create stories of your own. Better pot for better brews! 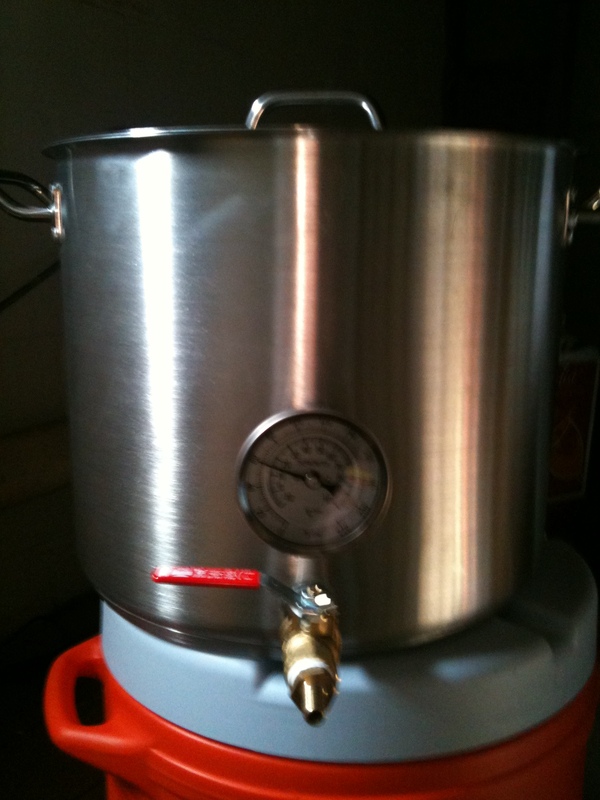 After building my mash tun in my quest to upgrade to all-grain, my next move was a bigger brew kettle. I had been doing partial boil extract, and my little 4 gallon pot just couldn’t handle the 6+ gallons needed for all-grain. Like most homebrewers, I started my research online. I knew I wanted to keep to to 5 gallon batches, so larger pots and keggles were out. I consulted with my homebrew guru Joe Postma, who heavily recommended checking out the Heavy Duty Brew Kettles with Ball Valves from MoreBeer.com. I went with the 32 Quart Heavy Duty Brew Kettle with a Ball Valve. It was exactly what I wanted. It’s big enough to easily handle a 5 gallon batch. The seemless weld for the 2 ports ensure no leaks. And it’s super solid so it should last a long time. From the picture above, you can see I did a few custom upgrades to it. First, after getting the ball valve assembly, I added a threaded thermometer to help keep a close eye on my temperatures. Since I use this to heat up my sparge water, the thermometer will definitely be helpful. 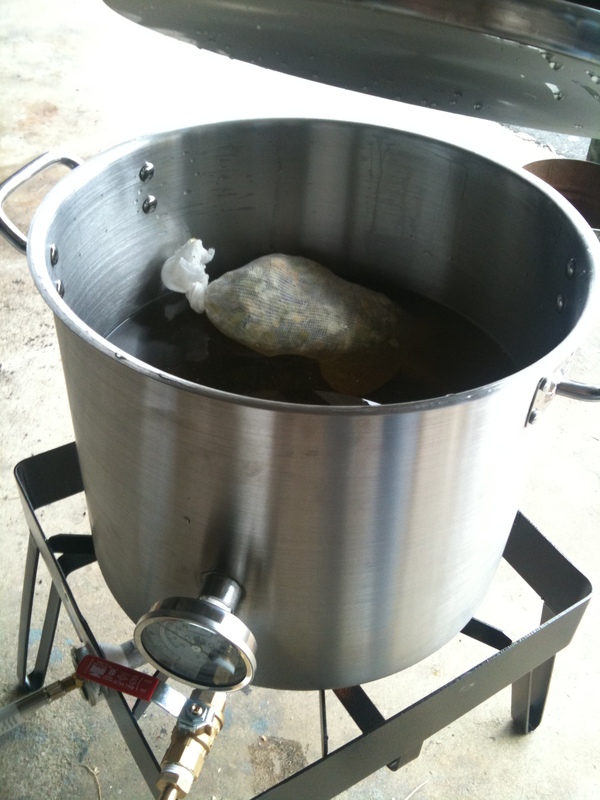 Second, I added a braid filter to help keep the hop leaves and trub in the kettle and out of my beer. I use the same braid filter I made my mash tun. I simply made 2 with the correct fittings when I built my tun. So far the kettle’s been great. I’ve had no problems with it at all. It holds heat really well. The thermometer’s been a huge help too. I always know where the water and the wort are at. My only complain is by my own doing. 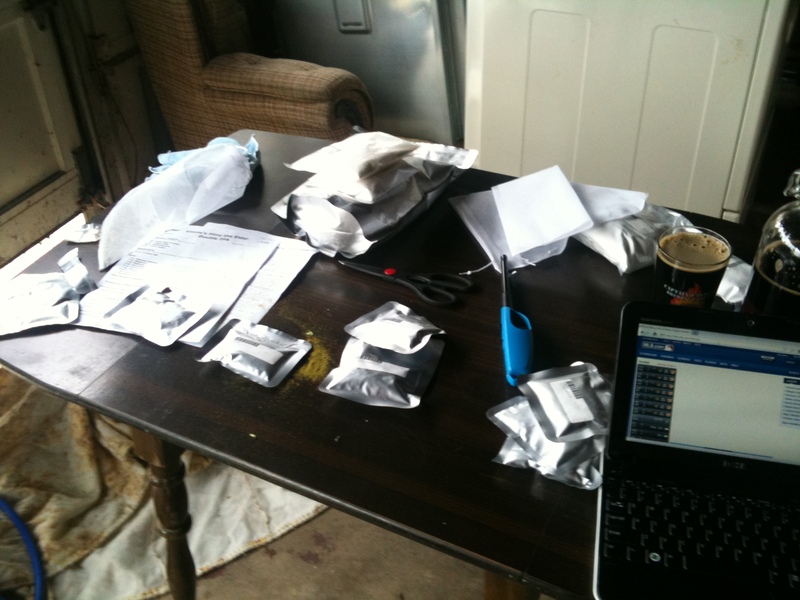 I didn’t use hops bags making Travis’s Matrimonial Mild, and the hop pellets clogged my braid filter. I was hoping to be done with hops bags, so its my own fault. But, I learned my lesson, and I’ve got my all-grain brew days down pretty well! 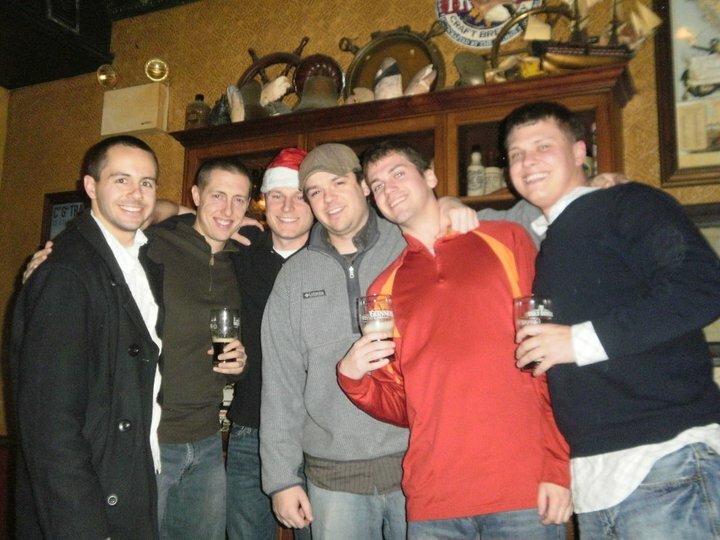 With the year 2009 coming to a close, The River Crew gathered to celebrate the end of another memorable, life-changing year by doing what we do best – drinking in excess. We were fresh off a Thanksgiving trip to Vegas for Jake’s wedding (it was planned, I swear!) where we discussed the possibility of ringing in the New Year in a bit of a throw-back way with an old school power hour. Stew (of the Breakfast Stout fame) had recently found his power hour CD of timeless hits from when we were in middle school and high school and really wanted to take it out for a spin. So on December 31st we settled in around Travis’s basement, jamming to tunes we’d long forgotten (some of them on purpose) and putting down a shot of beer every time a new song came on. When we were about half way in and starting to feel good, someone channeled their inner Ernie Banks and said: “Let’s Play 2!”, meaning they wanted a second spin on the power hour roller coaster. Most of us (or at least myself) laughed this off as some ridiculous notion, knowing we could barely accomplish such a feat in our drinking prime of college, let alone being 5 years removed. But, as we closed in on the end of the hour, the idea was again proposed, and this time was greeted with nodding heads and smiles from people clearly feeling the affects of the previous 50 minutes. Those who hesitated were threatened of being left off “The A Team”, and you know how challenges are received while under the influence. We took a 3 minute break before stumbling back to the table to give it a second go. Notice me using Stew to hold myself up. The rest of the night was a blur. I kind of remember singing my heart out, a spontaneous dance party, missing the ball dropping, and being EXTREMELY offended at what J-Lo was wearing. 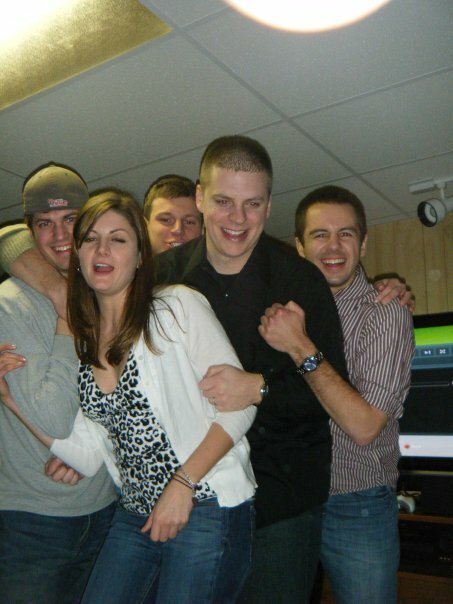 When we were ready to leave, the guys tried to convince my girlfriend (who did not participate) to let me stay. Her response was: go talk to him. After a short conversation I have absolutely no recollection of, it was agreed that it was in my best interest to head home. 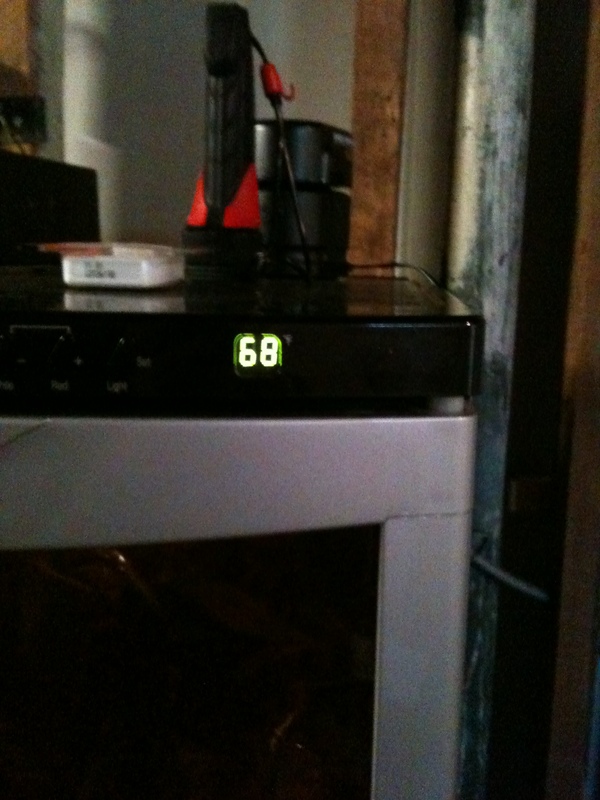 If you remember back, I had some trouble with my fermentation temperatures. Due to the ambient summer temperature in my apartment, I had a few beers ferment at around 80+ degrees. This led to some off-flavoring in my beers, and I actually ended up dumping a few of them. After getting a few negative reviews and feeling the pain of dumping beer down the drain, I knew I had to step up my game. 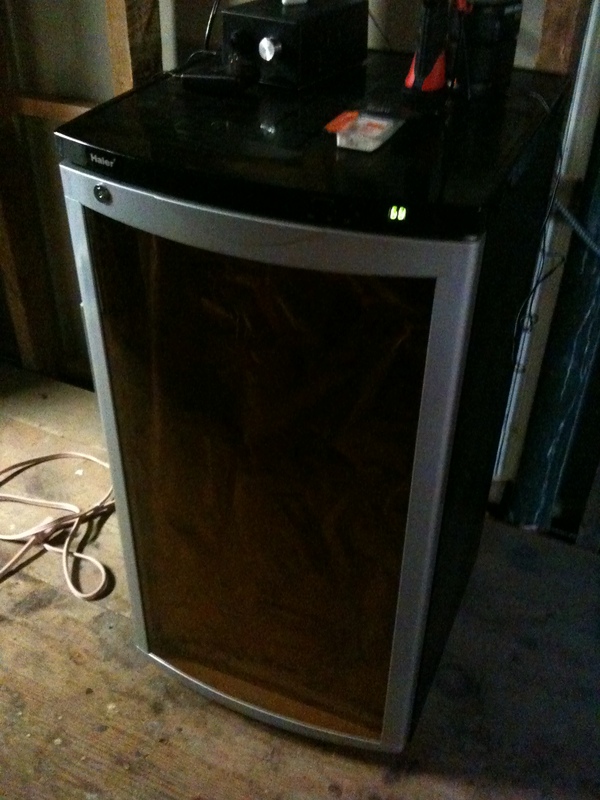 One of the first things I did was jump on Craigslist and look for a small fridge to help control my fermentation temperatures. With space being an issure, I wanted something I could keep tucked in a closet, but big enough to hold a primary fermentor. After a few days of research, I came across the wine fridge pictured above. 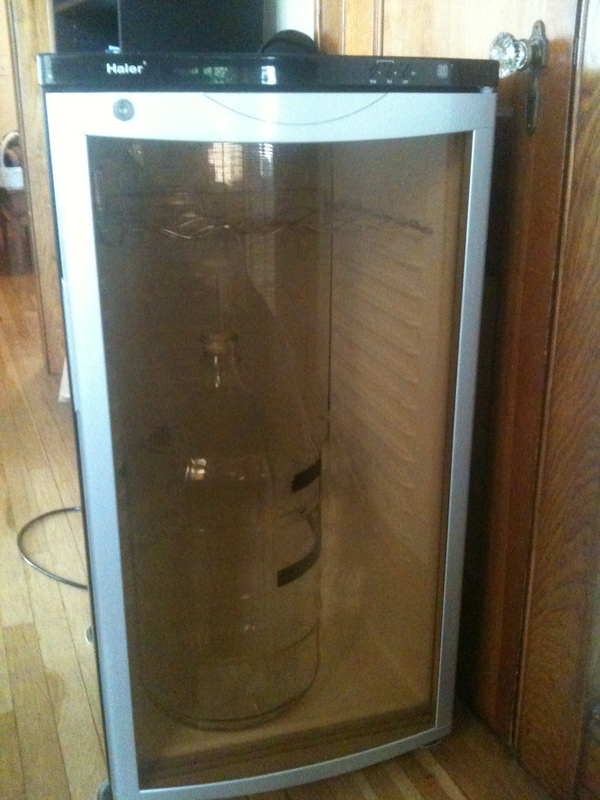 It was exactly what I was looking for – it’s 48 bottle capacity can hold a primary fermentor, airlock, and have enough room for a blow off tube. Plus, I could easily slide it into a closet to keep it out of the way. What put this fridge over the top was its external temperature control. It has buttons and an LED readout that let me keep the fridge at a constant temperature between 60 and 45 degrees. It’s the control I was looking for and was sorely lacking before. While 60 degrees seems low for an ale, it’s better than 80 degrees, and I’ve found that the temperature inside the primary during fermentation is usually a few degrees higher than the temperature around it. Plus, this gives me the ability to lager beer as well. 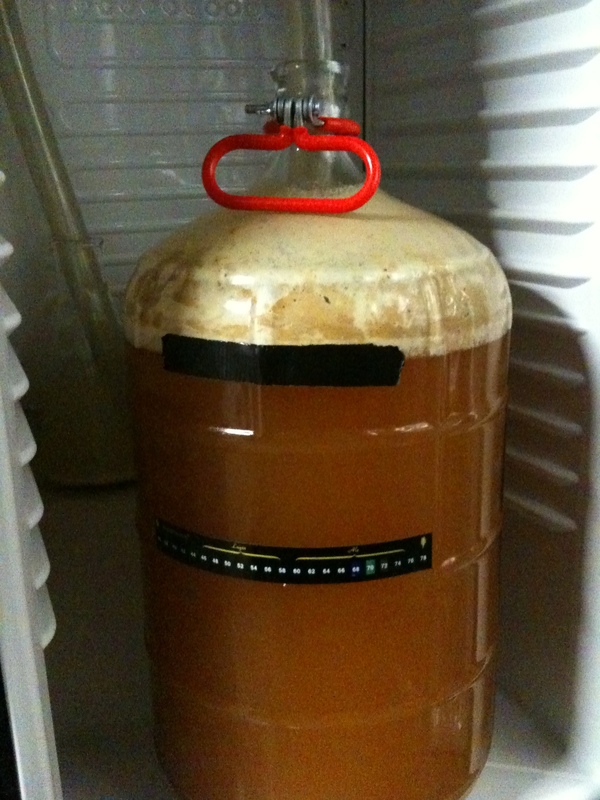 So far I haven’t had to use it, as the temperatures lately have been fermentation-friendly. Come summer or my first lager, I look forward to giving it a spin! Start your day the beer lover’s way This is a dark but light-bodied brew with a nice toasty character and a sweet finish. Pairs perfectly with CoCo Puffs. Back when we were younger lads and drinking was of questionable legality, the crew engaged in the time-honored tradition of Senior Week. Invading a friend’s beach house, we were fully prepared to take full advantage of all the perks that came with a free beach house and no parental supervision. About mid-week, Stew decided our usual methods of drinking didn’t give him an early enough start on the day, and took matters into his own hands. 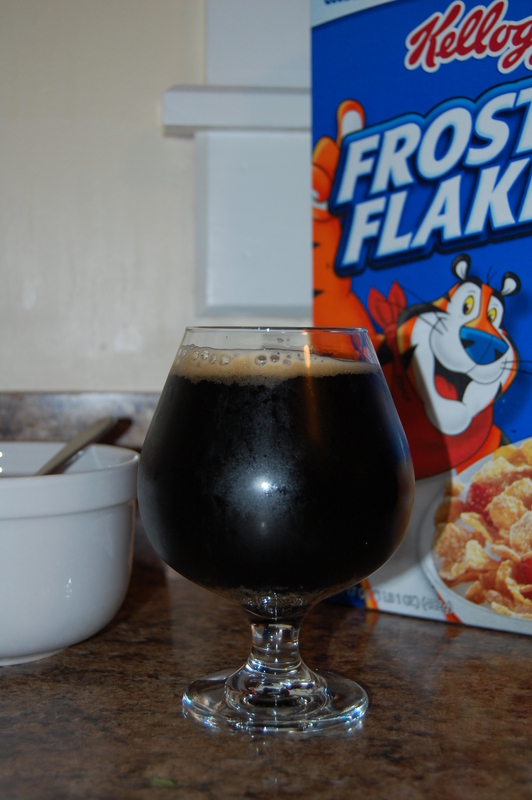 Instead of milk in his morning cereal, Stew decided to make his own breakfast of champions and use beer. While the result won’t make the culinary hall of fame, it will go down in the book of legends. Breakfast of Champions - It's Grrrrrrrrreeeat! I knew I wanted to brew a stout, but I didn’t want to do just any old stout. After recalling the story above over some beers with the Crew, I knew it had to be a breakfast stout. Plus winter was right around the corner, and a stout would be great to have on-hand. I did some searching online and found a recipe for one on Northern Brewer. But after reading it over, it looked like it was more of a porter than a stout, and some of the review agreed. Looking to bump up the body and add a little more oomph to this recipe, I did what any brewer would have done – I doubled it. I thought this would be the easiest, most effective way to pump up the OG and make this beer a Stout. What makes a Breakfast Stout are the ingredients, and this one includes flaked oats and lactose – the sugar found only in milk, and the stuff that makes your tummy gurgle if you’re lactose intolerant. The oatmeal’s intended to add some silkiness to the beer, and I toasted them a bit before I steeped them to give it a bit of a toasted quality. The lactose is mainly unfermentable, meaning most of the sweetness will stay in the final product. I’ve never brewed with either of these ingredients before, so it was going to be a learning experience. And both show through in the final product. It’s pretty close to the beer I wanted it to be. Like it’s described above, it’s a dark, slightly toasty and very sweet beer. Okay – so it’s a bit too sweet. I may have overdone it with the 2 pounds of lactose. But like I said, I never brewed with it before, so I definitely learned my lesson on this one. But, people seem to like it. I’ve had a few friends who aren’t beer people really like it. And I had a fellow homebrew try it and say: “Well, you’ve got Guinness beat.” Can’t beat that kind of praise. When I brew this beer again, I’m definitely toning down the lactose. I’ll probably half it, or maybe even less. I might toast the oats a bit longer to get some more roasted flavor in there. And, in probably my most ambitious move as a homebrewer, I plan on making a peanut butter version of this beer. 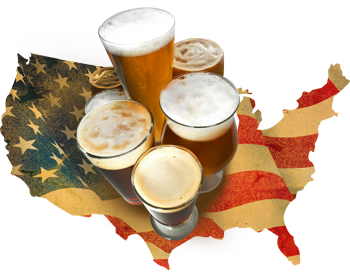 It cites the creativity of craft brewers as an factor in this increase. There’s no doubt this is a factor in it’s growth, and its become a defining characteristic of the industry. I think there’s a few other reasons, when coupled with this, are really responsible for the uprising of craft beer. Thank you so much for sending this. I love being “tapped in” (get it?!) to the beer market. Historically, craft beer (brewers who make less than 6,000,000 barrels a year) has represented about 5% of the industry, so seeing them make up almost 10% is really encouraging. I think this is due to 2 things, and the article touches on 1 of them. The first is the whole “foodie” crazy being lead by the Food Network and the sudden interest in culinary efforts. People are enthusiastically exploring new tastes and new cuisines, and chefs are actively searching for new and different ways to bring it to them. They don’t want the same old meatloaf when they can pay a few bucks more and get a port braised pork shank served over autumn root vegetables. The same goes with beer. Why would I want a light lager with little flavor besides carbonation when I could have a bourbon-barrel aged imperial stout? The new styles and tastes being introduced by the innovative craft brewers are really hitting home with consumers looking for something different. The second is the trend to “go local”. We see in our work that more and more supermarkets and retailers (aka Walmart) are trying to bring in more local produce to help reduce costs and reduce their environmental impact, while shoppers want to support their local community and take comfort in knowing that they’re helping a family who grew the product they’re buying by hand and have been doing so for years. I think the same goes for craft beer, and couples with the movement for new tastes I mention above. I can get the same can of Bud Light down the road here as you can at your local establishment. Or I can get a pint at the new nano-brewery down the street, the new hyper-local place opened by a guy with a dream. There’s a certain point of pride in buying local and supporting the little guy. Anyway, I’ll get off my soapbox now, but thanks for passing this along. The beer article below made me think of you! #BrewYork 8 – The Ocho! Chris at IDrunkThat said it best: “craft beer is all about great drinks with great people.” It’s power to pull people together and share smiles, stories and salutations make it one of life’s greatest pleasures. 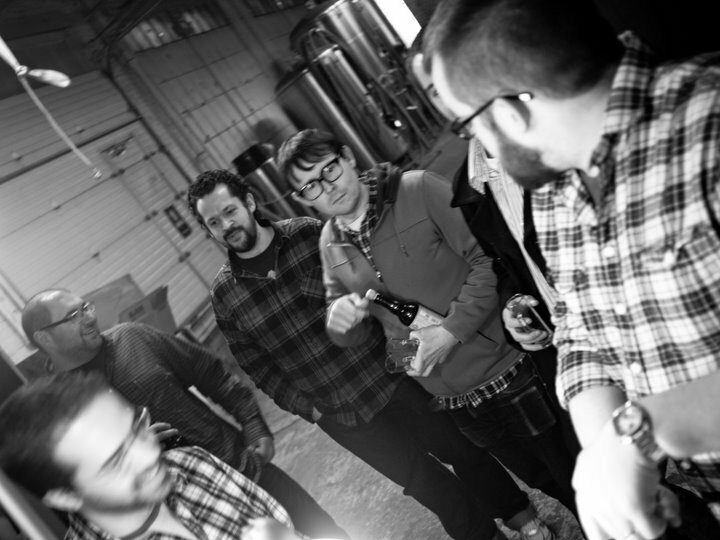 And when those people gathering are some of the most passionate and knowledgeable beer geeks around, armed with bottles their hand-picked favorites, you have yourself a #BrewYork event. We had a smaller group this time out, but we had a great time just the same. The IDrunkThat link has some great pictures, and new friend Matt Garland has some great shots here (I stole the bottle shot above and below from him).